Boden Size 12 ( could be suitable for a small 14 also ). Lovely Wallis dress. Size large 16 18. In a lovely sheer floral lace fabric, in a deep navy blue. Lovely swing skirt, with pretty scalloped hemline. Flattering deep V neckline at the back. Back zip detail. very striking. Bought for a wedding,that sadly didn,t take place. Warehouse Dress 8. Condition is Used. Dispatched with Royal Mail 2nd Class. Barely worn, great condition, beautiful pattern. Monsoon Dress Vintage inspired / Tea dress / Wedding / Evening, size 14 . Condition is Used. Dispatched with Royal Mail 2nd Class. FLORAL PATTERN. SPECIAL OCCASION. SIZE UK 10. LONG SLEEVED. Helmut Lang dress. Florlength, works for both occasion and relaxed. 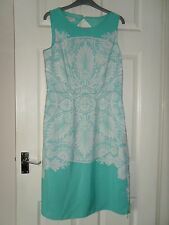 Stunning Size 16 Midi Length Tea Dress In a lovely Pale Blue colour. From a smoke and pet free home Condition is New with tags. Dispatched with Royal Mail 2nd Class. Any questions please ask and check out my other items. 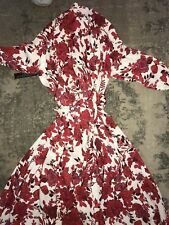 Beautiful stretch jersey floral dress by whistles - uk 10 - bust is 34" - length from shoulder is 40" - fully lined - no zip, just pull on - new -. Pretty ELVI fully lined, long sleeveless dress plus size 26. Excellent condition. Get Free Quotes. Cut on the bias with stretch. STAR by JULIEN MACDONALD UK SIZE 16 FABULOUS STRETCH MAXI DRESS CRUISE WEDDING. Condition is Used. Dispatched with Royal Mail 2nd Class. Grab a bargain! It has a one shoulder design and it's made from thick stretchy fabric for a flattering fit. Treat yourself! Reiss Ladies Dress Ruched Lola Dress S14. Condition is Used. Dispatched with Royal Mail 1st Class. Ladies Boden coral Dress - Size 16L. Beautiful dress with lovely fold detail, perfect for a summer party or wedding. Worn once, from smoke and pet free home. 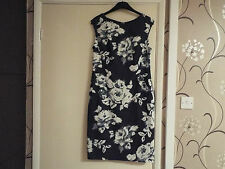 Beautiful Laura Ashley floral navy dress, size 10, in excellent condition. Beautiful Phase Eight "Apples" Print Dress. An Occasion. RRP £89.00. In perfect condition. Fabulousfor a specialoccasion or wedding. BNWOT Boden yellow green lined floral print dress wedding prom occasion 12L. Condition is New with tags. Dispatched with Royal Mail 2nd Class. Worn but in good condition. Ideal for smart work wear or could be dressed up for an occasion. VIBRANT RED/BLACK/white TUNIC DRESS BY WALLIS, 12 PETITE. Condition is Used. Dispatched with Royal Mail 2nd Class. Women's floral Somerset by Alice Temperley dress size 18. Striking dress with v-neck, soft gathers under the bust, long sleeves and large tie making it incredibly flattering. Perfect dress for a Summer wedding or a garden party. Always got loads of compliments but I have lost weight and it's now too big. Condition is used but only worn twice and in perfect condition. Dispatched with Royal Mail 1st Class. LOVELY FRILL DETAIL. 2ND CLASS SMALL PARCEL. LENGTH 48" APPROX. UNDERARM TO UNDERARM 25" APPROX. BACK BUTTON KEYHOLE FASTENING. 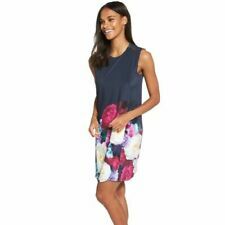 Phase Eight Kimono Style Floral Dress Size 8 This kimono-inspired silhouette is both stylish and flattering thanks to the classic v-neckline, wide short sleeves and an enhanced waist. It features pockets, is fully lined and falls at the knee. It is finished with a tie at the back and a concealed back centre zip. This dress has only been worn on a few occasions and is in excellent condition. Look stylish in this lovely dress from KAREN MILLEN in stretch material with print pattern, draped detail and zip fastening on the side, great for formal or special occasions. Length 41". Care Instructions. Nextl Long Dress Size 8. Condition is Used. Dispatched with Royal Mail 1st Class. Vgc full length black evening dress. Ruche long sleeves. Bodycon Bust 36-38". Next Tropical Pattern Floral Cold Shoulder/Straps Occasion Dress Size 20. Navy & Tropical Pinks Rose Pattern. Stunning linear detail on from and straps. Full length zip up back extraordinary detail. Fully lined heavy viscose material perfect for all seasons. Two thick straps giving support and comfort or wear without with cold shoulder sleeves. Condition is worn once for Special Occasion in immaculate condition. Smoke free Pet Free home. Dispatched with Royal Mail 1st Class. Moschino Dress. Condition is Used. Dispatched with Royal Mail 1st Class. 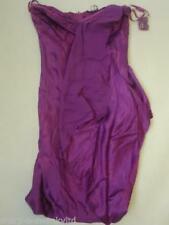 This is a stunning dress by Jane Norman size 8 BNWT! RRP- £45! The dress is in a wiggle style so very fitted to show off your shape in all of the right places. Due to the style I would size this dress as suitable for a size 6. QUALITY V NECK PENCIL DRESS FROM JIGSAW. JUST ADD A BLACK JACKET. UNDERARM TO UNDERARM IS 16" LAID FLAT. MACHINE WASHABLE ON A GENTLE HANDWASH. NICE BIT OF STRETCH FOR A FLATTERING FIT. So Couture Red Dress. This has been worn once to the races so like new. Minusol, Red And Black Scoop Neck Vintage Style Dress. 'Minusol', Red And Black Scoop Neck Vintage Style Dress. Has fitted style with a flared kick hem. Gorgeous as statement work wear or for a special occasion. Condition is New with tags. Dispatched with Royal Mail 1st Class. Ghost Dress | Maxi Length | Jewel Blue | Size Medium. Excellent condition. Worn once. Elegant occasion dress. Perfect for a May Ball or Prom. Roman dress in pink, cream and navy 18 BUT MORE SUITABLE FOR 16! This is a stunning coloured dress that has had some repair ( see last picture) Still f fabulous to wear but would suit 16 person better. ( trying to be honest) Pit to Pit measures 21.5" which is 43 bust. Suitable for any special occasion, such as a wedding! Or just any wear any day. Really , really smart. Please be sure about alterations as do not refund, sorry. New Women's Ladies ChristmasNaughty Swing Dress Plus Sizes!